Hello Kitty Kitchen Cafe Just $40! Down From $80! You are here: Home / Great Deals / Christmas Deals / Hello Kitty Kitchen Cafe Just $40! Down From $80! 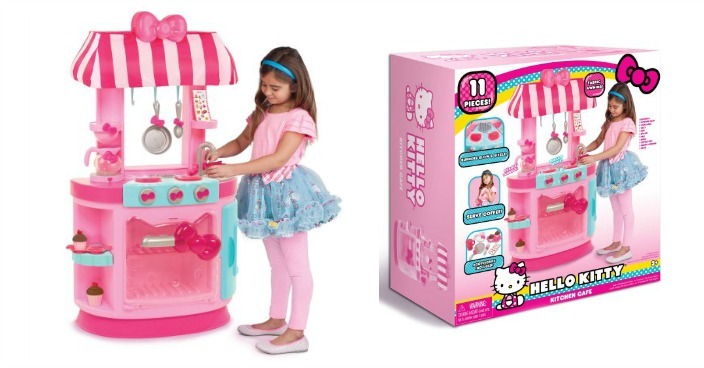 Right now you can get this Hello Kitty Kitchen Cafe for just $40 (Reg. $80) at Walmart! It’s time for cupcakes at the Hello Kitty Kitchen Cafe! The Hello Kitty Kitchen Cafe is the most adorable two-in-one kitchen and cafe ever! Open up shop and get ready to serve your friends all sorts of treats! This deluxe cafe has a real fabric awning and comes loaded with accessories to play out owning your own cafe. Watch out for the hot stove, it really sizzles with lights and sounds! Includes a coffee pot, coffee mug, two cupcakes and serving tray/muffin pan, a removable oven rack, one pot, one spoon, one ice cube and a menu for endless play.